Star Clippers offer a cruise experience that is like no other. If you are looking for an adventure on the waves which includes the atmosphere and character of traditional sailing but still with the comfort and luxury found on most modern cruises; you have come to the right place. Our small ship cruises will provide the opportunity to meet new people, see new places and, most of all, create the holiday experience of a lifetime. Feel the wind in your hair and the salty breeze in your face as you sail aboard what feels like your own private yacht. Our vessels provide a much more intimate experience than you may expect to find on board a contemporary cruise liner, and whilst the surroundings you find yourself in hark back to the ships of the nineteenth century, the superb, personable service will be on hand to make you feel right at home, wherever you are in the world. We sail to some of the most picturesque and luxurious locations in the world; meaning that not only is your time at sea an inspiring experience, the ports you visit along the way are truly magnificent, too. From the Caribbean to the Panama Canal and the Mediterranean to Cuba, there is so much to see and do that you will never want your adventure cruise to come to an end. Our fleet is made up of three strikingly tall sailing ships which add an air of style and elegance to any cruise. These four and five-masted boats really do make a lasting impression on anyone who sales in them and will leave you feeling nostalgic for the days when these kinds of vessels ruled the oceans. Royal Clipper, the largest of the three and the largest ship of her kind, is joined by Star Clipper and Star Flyer in offering tall ship cruises to sailing and adventure enthusiasts all over the world. 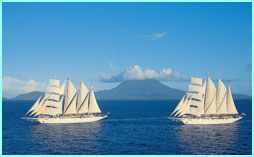 - Star Clippers is the only cruise company to offer an authentic, natural sailing experience. - Passengers can get involved with sailing the ship, climbing the crows nest and pulling the ropes. 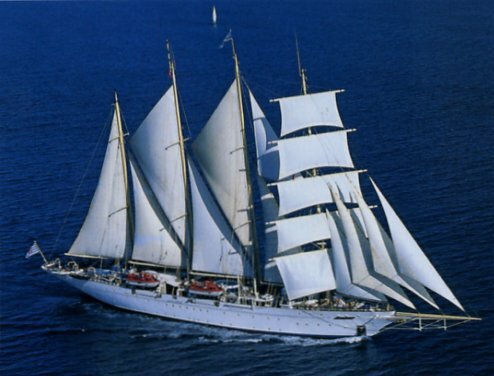 - Star Clippers operates three of the world’s largest and tallest sailing vessels. Visiting intimate ports often untouched by larger cruise ships and offering passengers the activities, amenities and atmosphere of a private yacht. - We have an extensive range of destinations to choose from including the Caribbean, the Mediterranean, Ocean Crossings, Asia, Cuba and Indonesia. - Watersports are complimentary on board, such as Kayaking, Wind Surfing and Snorkeling. - Star Clippers sailings are full board. Our inspired chefs make dining aboard a delightful culinary adventure with an international menu of foods from all corners of the Earth. - Royal Clipper, the largest and only five-masted full-rigged sailing ship carries just 227 guests. 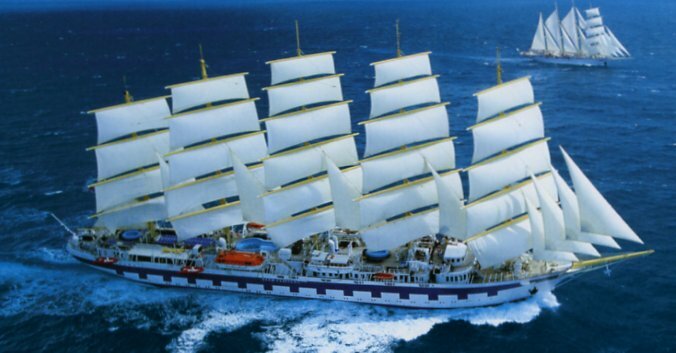 Sister ships Star Clipper & Star Flyer carry 170 guests each. On board, guests will experience 2:1 guest to crew ratio. - Passengers can enjoy the romance of sailing on board a true tall ship in a relaxed atmosphere with high standards of service provided by an attentive crew. All three ships have expansive teak decks, swimming pools, informal dining, a convivial Tropical Bar and a comfortable piano bar. 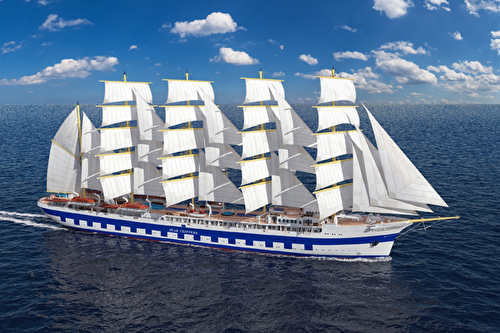 Star Clippers unveiled their fourth and most impressive vessel to date – the Flying Clipper. This stunning new tall ship will measure 8,770 GRT and be powered by 35 sails, which will collectively total more than 6,350 square metres. The SPV Flying Clipper will be the world’s largest square rigger and the largest ship of its kind afloat today. Influenced by the German tall ship Preussen, which graced the seas for eight years before it was involved in an accident in 1910, the Royal Clipper has the proud distinction of being the largest and only five-masted full-rigged sailing ship built since her predecessor was launched on her maiden voyage from Bremerhaven. With her complement of 42 sails, which have a combined area of 56,000 square feet, Royal Clipper stands out amongst her peers in more ways than one. These are true ships reflecting their proud heritage in every inch of their polished brass and gleaming bright-work. Step aboard these unique vessels and discover a new age of sail, where the traditions of the past are happily married to the comforts and amenities of the present day. Star clipper and Star flyer are modern cruise ships in every way, created for luxury-loving passengers who also love the traditions and romance of the legendary ara of sailing ships. Star Clipper and star flyer are both 115 metres long and each carries just 170 guests in pampered comfort. Life aboard is blissfully relaxed, much like travelling on a private yacht. You will never feel confined on Star Clipper or Star Flyer. Each ship offers spacious accommodations and expansive teak decks with ample space and not one, but two swimming pools. In fact, you will that these ships offer more outdoor space per passenger than most conventional cruise ships.